Chapter 1: (08:20) Key of F If you are like most guitar players, the key of F is probably a key that you have avoided. In today's lesson, Mary Flower teaches us how to use that dreaded key the easy way. The chord shape Mary uses here is quite simple. 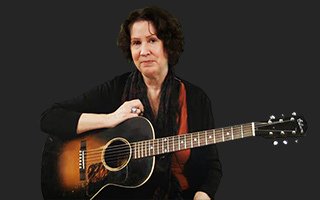 Instead of barring the whole F chord, she uses her thumb to wrap around the neck of the guitar leaving the other fingers available to add some nice embellishments. Mary shares with us a classic I VI II V ragtime chord progression. In key of F these chords are F, D7, G7 and C7. Notice how all four of these four are dominant in quality. Many classic tunes are based on this chord progression. Once you are comfortable with the chord shapes, you can easily incorporate some new bass lines and embellishments to make the song more interesting. Wrapping the thumb around the neck might require a bit of adjustment, but after a bit of practice it should become easier. Keep working on it until it gets comfortable and experiment in the beautiful yet unconventional key of F. Practice well! Hi Mary, Excellent and unique lesson in F. Any luck in putting up Salty Dog in I VI II V? If not where can I find it? Great lession Mary, by the way what kind of thumb pick do you use. Thanks so much for providing comments on a key that is virtually untouched by all but a few. If you play this, even a veteran player will take a closer glance.